Got a Carburetor? You gotta check this out! Fuel injection is a really cool, but carburetors are arguably just as cool. That’s what it is all about too, keeping it cool. This is a new product from Cool Carb Technologies – their thermal heat shield system. 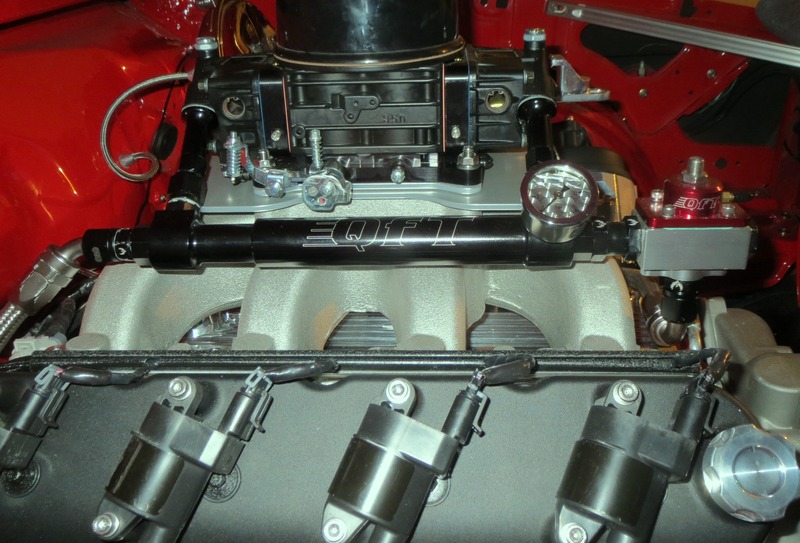 It blocks the heat, separates the carburetor from the hot intake, which will keep the fuel cooler and make more power with a more dense fuel charge. Follow along and click on the links to check out this latest addition to the LSX El Camino. This photo shows the kit we ordered for the LSX El Camino. Fuel injection and composite intakes are designed to insulate the fuel from the engine heat. Put that together with cold air intakes and you maximize the opportunity to have a dense fuel/air charge for making the most power during naturally aspirated combustion. Carburetors generally sit on top of an aluminum intake that will heat up over time unless you have a composite intake manifold for the carb. I bet most of you out there have an aluminum or iron intake on your classic car and possibly on your modern swap. Even if you do have a composite intake, heat will still rise up from the engine and heat soak the carburetor fuel bowl and accelerator pump. Cool Carb Technologies agrees with me on that and has provided a really cool solution to the heat soak and heat transfer issues – the patented thermal heat shield. The concept is simple, isolate the fuel from the heat source to keep the fuel as cool possible before it enters the intake manifold. When fuel heats up, it will expand; if it expands then the pump will not work as efficiently and there will be a loss of power and throttle response. Check out our installation of the Cool Carb Technologies heat shield system on the LSX El Camino in this video. Why hasn’t this been done before? Well, from my understanding, it has been done before. 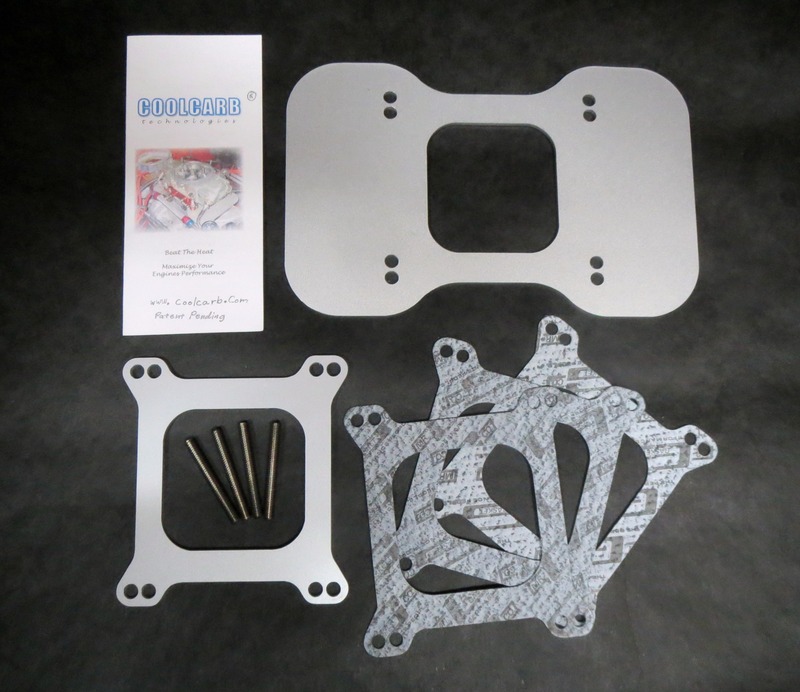 The aluminum spacer plates were a great start, and do work well, but the Cool Carb Technologies heat shield gets its performance from the material in which it is made and its shape. The aluminum/poly-core/aluminum composite material deflects, absorbs, and disperses heat coming up from the engine. The shape of the shield blocks the heat rising from the engine which keeps it from heat soaking the bowls and the material keeps it from transferring heat by contact . In the photo below, you can see this is actually a very attractive product and matches Greg’s overall color scheme of black and silver. What else can carb guys do to maximize power? In the video you were introduced to the Quick Fuel Technologies BDQ-950. The Black Diamond series carburetors are coated by NitroPlate and advertise a 6% drop in fuel temperature. Also in the video, you were introduced to the Spectre Performance “Extra-Flow” air filter with the breathable lid (part # 47621). These filters maximize airflow and can be ordered with cowl hood heat shield to keep intake air temps down as well. Form and function are really matching up here! Again, the idea is keep the fuel cool by using both the Cool Carb Technologies heat shield and the QFT-BDQ-950. Plus, by collecting a dense air/fuel charge, I think we have a great combination for maximizing potential power.